Freshly made pizzas from our refrigerated production area are placed into hot infra red conveyor ovens that send out perfectly cooked pizzas. Email us at orders@pizzasquare.com We accept credit cards. Our contract may be viewed or downloaded here. 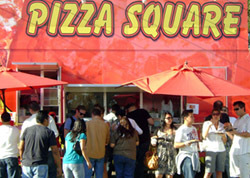 Pizza Square offers your organization an opportunity to fund raise right on your premises. 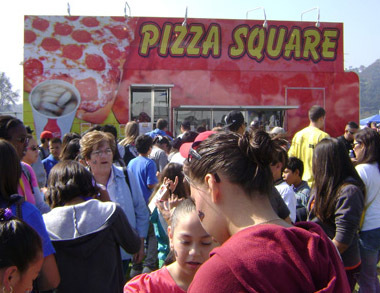 Pizza Square will come to you on a prearranged date and produce full pieces for your community. Presales of pizzas and other food products for the community may be done by your organization and therefore providing you an advanced stream of revenue. 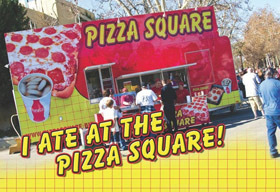 Pizza Square will rebate to your organization between 20 and 25% of all sales. You will be able to control the rebate by doing presales and therefore know exactly your level of fundraising. It is inevitable that there will be last-minute one on-site sales with your organizations promotion. Pizza Square will be prepared to accommodate those last-minute sales. Your volunteer staff will be greeting, taking orders, and providing the products right to your community. Pizza Square will provide you all the tools necessary as well as assistance with presales and promotion to make your fundraiser a success. 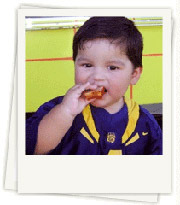 To schedule your fundraiser drop us a line at 213-280-3548 or e-mail us at info@pizzasquare.com.